Jollibee may be the largest fast food chain that most Americans have never heard of. After starting as an ice cream parlor in the Philippines in 1975, Jollibee has grown to more than 1,200 restaurants, mostly in Southeast Asia – and the parent company operates another 1,000 stores across other brands. Known for its Chickenjoy fried chicken, Jollibee offers an eclectic menu, ranging from burgers and sandwiches to spaghetti and noodles. Desserts include peach mango pie and a unique blend of ice cream, fruit, jellies and shaved ice known as Halo-Halo. Jollibee opened its first U.S. restaurant in the San Francisco Bay area in 1998. Expansion in North America has been measured since then, growing to about 35 stores in 2017. Jollibee focuses on markets with strong Filipino populations – eyeing expansion not just in the U.S. and Canada, but also Australia, Japan and Europe. eSite Analytics started working with Jollibee in 2015, helping it to find locations with the best chance for success. Using eSite’s Trailblazer™ spatial analytics tool, Jollibee can forecast potential earnings by location, using map-based technology and up-to-date driving data. 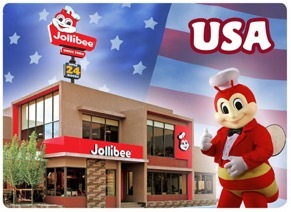 Food & Wine recently published a profile of Jollibee USA. To read the article, click here.